Posted by elizabethwong in Current Affairs, Democracy, Politics. I’m speaking intermittently here and there, and usually the schedule won’t be confirmed til the morning of the ceramahs. But on 6th March night, Sivarasa and I will be speaking at Bandar Utama. Details will be posted as soon as details are firmed. In the meanwhile, come Sunday, we are launching our MOBILE KEADILAN at Centrepoint, Bandar Utama 0930 hours. This is all thanks to a fantastic team of supporters who walked in and offered their help this week. On the matter of the PACA written earlier, Madeleine clarified that the deadline was for PACA for postal votes. So, we still have time ’til this Wednesday for the deadline. Posted by elizabethwong in Current Affairs, Democracy, Malaysia, Politics. Bahasa Malaysia , English , Chinese and Tamil. Last night, we were informed that Polling and Counting Agents have to have their names, IC numbers in by this FRIDAY! Ah, satu lagi keputusan petir SPR…. We need a couple of hundred people who are willing to sacrifice just one day on March 8, to help ensure there won’t be any cheats or ghostly voters. Please write to: <bukitlanjan2008@gmail.com> if you wish to help! I’m a voter since 1986. Since 1995 I vote in Puchong. When i checked my name before nomination at SPR web site I’m still a voter in Puchong. But when i checked my name just now, i’m not a voter, i can’t vote. I’m now at Kajang PKR bilik gerekan, we received some conplaints that they vote in 2004 Dun Kajang, now they cant vote because they are not a voter, some had been tranfer to other areas. This sounds like my case during the 1999 General Elections. I registered in April 1997, had a receipt and all, yet my name didn’t appear on the rolls in 1999. I had to re-register again. 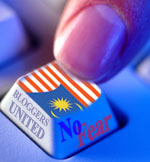 Is it incompetence or desperation on part of the BN/EC alliance? Either way, it’s reason enough to VOTE THIS GOVERNMENT OUT! LONDON: Overseas students have until tomorrow to register as postal voters. Election Commission (EC) secretary Datuk Kamaruzaman Mohd Noor said those entitled to vote by post still had time to register, provided they were already on the 2007 master electoral roll gazetted on Feb 5. He said electoral ballots would only be printed 72 hours after nomination as this was the “cooling-off period” where candidates may withdraw their candidacy. The highlight of the Monday was a stroll with R. Sivarasa at Kayu Ara after Maghrib, where I experienced ‘Makkal Sakti’ up close and personal. The response there was overwhelming, even more electrifying compared to the 1999 General Elections! Families came out of their homes to greet us, cheer us on and shake our hands. I remember boss Dr. Wan Azizah who once told me how her hand would be chaffed and blistered at the end of every election and by-election, and just a day after Nomination, I now know what she had meant. It feels great!!! There are many more miles to cover tomorrow. There’s at least 7 hours of solid walking and door-to-door interaction. We don’t have the 3Ms (Money, Media and State Machinery) so it’ll be the old school ways until next Saturday, but it’s heaps nicer to meet residents and talk to them in person. Anwar Ibrahim speaks at Subang Perdana around 9 pm. Now let’s go break BN Monopoly in Parliament and State Assemblies! Often, there aren’t enough polling agents and counting agents in each stream, which means cheats and phantoms voters can do whatever they want. DUN Bukit Lanjan (N37) has 12 ‘Peti Undi’ (geographical division of the area and voting locality) and 52 ‘saluran’ (total voting streams). This means with 2 persons alternating every few hours, we need a bare minimum of 104 volunteers to man all polling stations. Polling agents will then double-up as counting agents. If you wish to help out, please do register with us as we need to submit your names and details to the Election Commission. Training will be conducted this weekend to allow those who are new to this process to familiarise themselves. In the Subang (P107) constituency, all Opposition candidates got their nominations approved. 🙂 It’s all straight fights in the state seats (Kota Damansara, Paya Jeras and Bukit Lanjan) as well as the Parliament seat. The morning was not without the usual Election Commission nonsense. At the freshly painted green gates of the multipurpose hall, MBPJ Bandar Utama, we were refused entry initially. Apparently, the candidates, proposers and seconders all had to have name tags with a photo for ID purposes (and not all of us were given that). “No photo, no tag, no entry,” claimed an EC guy. “Isn’t MyKad enough? Is it not an ID?” I shouted. “You’re denying our democratic right to file our papers??? ?” exclaimed one of the nominators. On Saturday afternoon, the official letter from KeADILan was issued. My opponent is the incumbent Datin Paduka Yong. This won’t be an easy battle. Running around, meeting residents and volunteers, public speaking (sometimes spontaneous), fundraising, filling up forms, getting freaked out by new overnight regulations, wanting to slap the Elections Commission (who can give 2 different answers to the same question), not having enough time to eat, missing my kitten, missing my boyfriend even more, having phones depleted in a matter of a couple of hours, car breaking down, receiving a call from my high school friend who’s gotten 20 lawyers to join KeADILan …. And today’s just Nomination Day!